From making my Metro Hoops quilt top, I had 4 blocks left to make another hoop. Unfortunately I had realized that I had extra four blocks only at the end and had already used all pink for the last 4. I am making a pillow out of this extra hoop. I was thinking of how to quilt it and couldn't think of anything other than feathers. I also liked what Jenny @SewKindOfWonderful did with her quilt. But yet, I wanted to explore myself too. I still haven't gotten bored with quilting feathers. For the outer ring/hoop I might just Quilt-in-the-ditch and then echo it once. The outer most negative space I'm thinking of some straight line quilting. Great quilting. 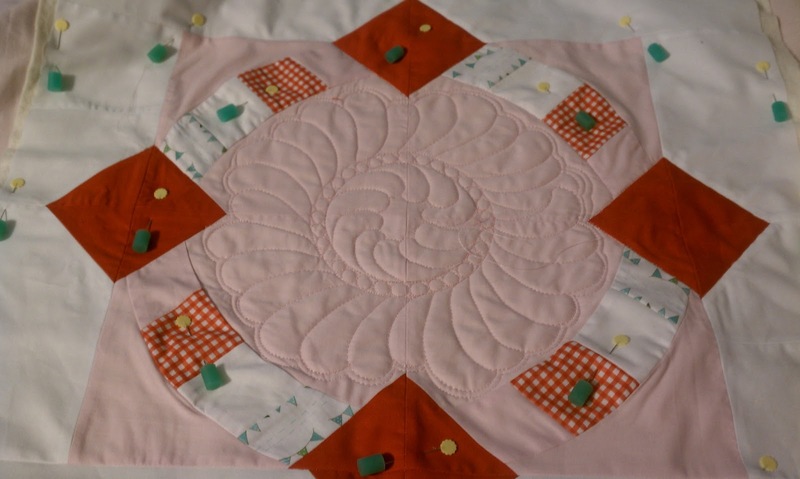 Love Jenny's ruler, makes so many cool quilts. Thank you, Pat! Yes, I just recently discovered Jenny's ruler and its absolutely amazing! Thank you, it was fun to quilt! Totally agree! Thank you, Alice! Those feathers are perfect in the center! Just perfect.